Line is a photographer extraordinaire from Denmark. She enjoys telling stories through her photographs, and she has developed a distinct artistic approach and style – Warm, refined, beautiful… She has been featured in several notorious magazines, books and ad campaigns, as well as on Nordic Design. A peek at her portfolio will make you want to see more of her gorgeous work! I’ve reached out to Line for her to take part in this Christmas post series, along with Danish accessory designer Yvonne Koné, photographer Jonas Ingerstedt and blogger Allan Torp (coming soon). When asked about how she intends to celebrate the holidays, she tells me that music from crooners and other legendary jazz singers will definitely be playing around the house: “It’s beginning to look a lot like Christmas” by Michael Bublé, “White Christmas” by Frank Sinatra, and “Have yourself a Merry little Christmas” by Bing Crosby. She loves to decorate her home with lots of glittery things, lights and spruce branches, and admits she goes a bit over the top as she gets wrapped in the Holiday spirit. The same applies to her Christmas tree: “It gets filled with all our old and lovely things, in plenty of different colours”. Line very much looks forward to this time of the year; the chocolate and marzipan truffles, white snow, old Walt Disney movies, lots of children, candles, warm socks, hanging around the fireplace, surrounded by lots of pretty, wrapped presents. 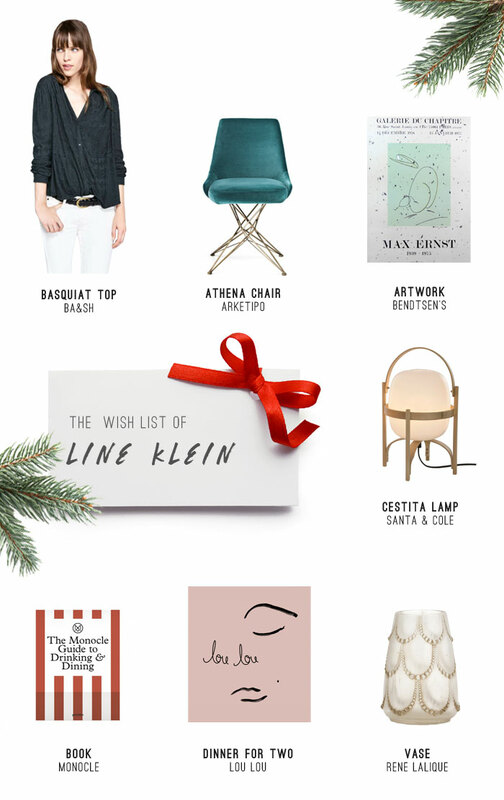 Here, you can find out what’s on her wish list for Christmas.